Some recipes are indispensable; these lamb shanks are of that breed. Incredibly good and remarkably easy. I simplified the original recipe slightly (not that it was complicated to begin with), and it could be further modified and adapted without much risk. This isn’t high flying patisserie, it’s a simple home-cooked dinner. For another occasion I may take it up a notch as per the original recipe, by first rolling the shanks in finely chopped rosemary, crushed coriander seeds, dried chilli, and a spoonful of flour before browning the meat. But recently I had no white wine, forgot the anchovies, even the garlic. It was fine. Really good in fact. The dish would live on without the carrots, and might even survive with no tomatoes (compensate with more celery and/or carrots). The essential elements are: onions and celery, some acidity (wine, vinegar), aromatics (rosemary, oregano, marjoram), and of course the magic of slow cooking. Here I followed the instructions and the result is perfect. Chop the onions, not too finely. Halve lengthwise then slice both the celery and carrots. Finely slice the garlic. Season the lamb shanks with salt and pepper. Heat a little olive oil in a heavy-bottomed saucepan, brown the shanks on all sides, remove from pot and set aside. Pour out the grease and wipe away any burnt bits. Pour a little more olive olive into the pot and cook the onion until just starting to turn translucent. Add the celery, carrots, and garlic, season with some salt, and cook for 7-8 minutes until the vegetables being to soften. Add the vinegars and cook for 1 or 2 minutes. Pour in the white wine and simmer for another couple of minutes. Meanwhile chop the anchovies, drain the tomatoes and cut them in half lengthwise. Add the anchovies and tomatoes to the pot. 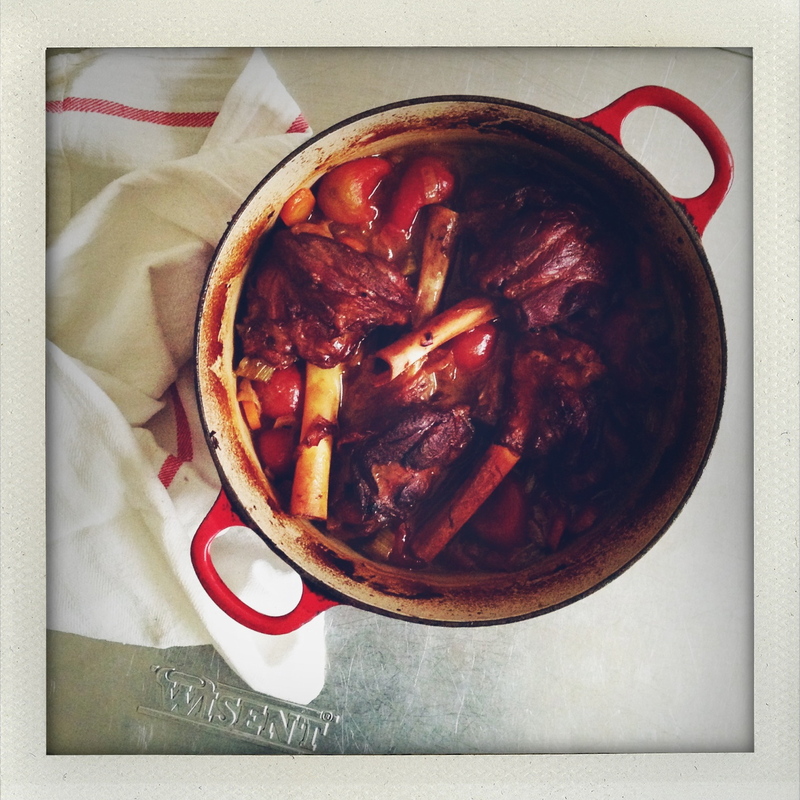 Swirl the pan to shake up the flavors and place the lamb shanks snugly on top of the sauce. Finely chop the rosemary to be sprinkled with the dried oregano (or marjoram) onto the shanks. Put on the lid and place in the oven. After 45 minutes turn the shanks over in the sauce (so that the part that wasn’t submerged now basks in the liquid) and place back into the oven for the another 45 minutes. Let rest and cool for at least 10 to 15 minutes before serving. Or better yet, let cool completely, refrigerate, and reheat the next day in a 350°F (175ºC) oven for about 20-30 minutes. Serve over rice, polenta, or mashed potatoes sprinkled generously with chopped fresh herbs.